The St. Louis Federal Reserve makes available over 480,000 U.S. and international economic and financial time series to registered users. Registering is free and easy to do. The service is called Federal Reserve Economic Data (FRED). FRED includes data from 85 sources, including the Federal Reserve, the Penn World Table, Eurostat, and the World Bank. In Stata 15, you can use Stata's GUI to access and download FRED data. You search or browse by category or release or source. You click to select series of interest. Select 1 or select 100. 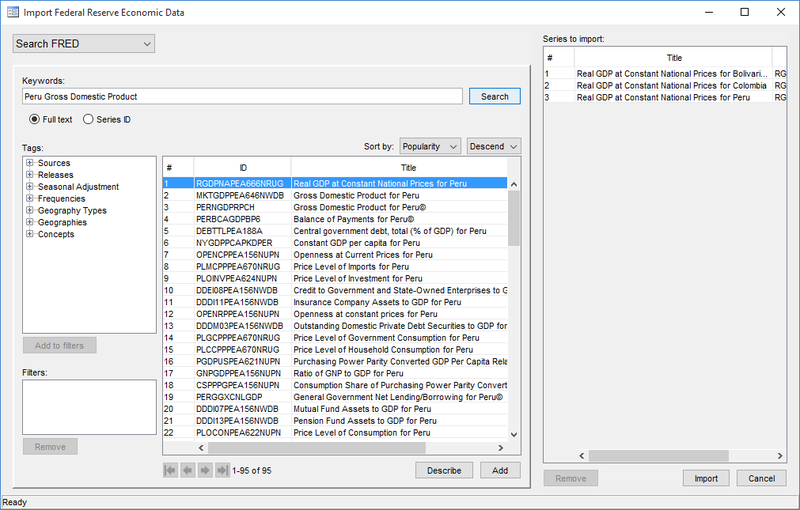 When you click on Import, Stata will download them and combine them into a single, custom dataset in memory. These same features are also available from Stata's command line interface. The command is import fred. The command is convenient when you want to automate updating the 27 different series that you are tracking for a monthly report. Stata can access FRED and it can access ALFRED. ALFRED is FRED's historical archive data.